others and shows that you come from India – The land of Inner(In) Light(dia). Its a cosmetic mark used to enhance beauty. You are beautiful and it makes you even more beautiful...Ask anyone and most of them will say that you look more beautiful with a bindi. A strong intellect can help one to make noble decisions in life, be able to stand up to challenges in life with courage, and recognize and welcome good thoughts in life. The bindi was created as a means to worship one's intellect.The worship of intellect was in order to use it to ensure our thoughts, speech, actions, habits and ultimately our character becomes pure. Whatever be the outer appearance, the real beauty lies within. Respect the life within you and know that you are beautiful and your soul is the real beauty. The body is subject to destruction and will eventually turn to ashes, but the spirit in us is immortal. We are very ancient, yet very new.Like the sun, like the air, like the water, like the earth which are very ancient but ever new and fresh, we are also ever new, a bolt of scintillating energy.Remember "Energy cannot be created or destroyed, it can only be changed from one form to another." There is a chakra (center of energy within human body) in between the eyebrows called Ajna (Aadnyaa) chakra meaning 'command center'.It is the gateway to our intuition, perception, and inner wisdom. When it is in balance, one will be able to think clearly and have a higher sense of awareness. Ajna chakra is associated with the pituitary gland which is the master gland of all endocrine glands in the body, whose secretions control all the other endocrine glands. Stimulating the pituitary gland helps in well functioning of this gland and thus the entire body. 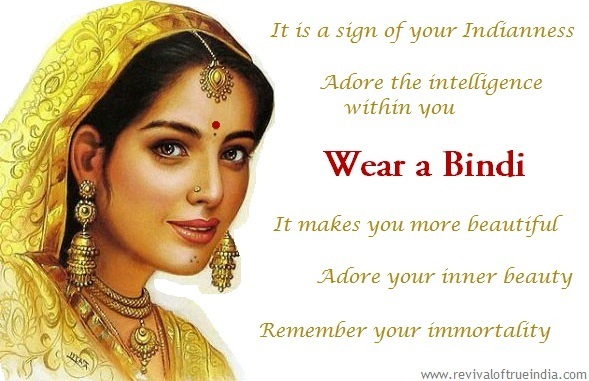 Our ancient people knew this and so the practice of applying tilak/bindi became a part of our tradition. Tilak/Bindi is worn on this Ajna Chakra. Respecting the intelligence and knowledge within oneself and adoring the life force which illuminates the body, one should apply the tilak or bindi.